Without a coating, lino was slightly less accurate at 3.38", and the velocity variation was slightly higher. The uncoated lino bullets left some faint streaks of lead in the middle of the barrel. It wasn't bad and it didn't get any worse as more shots were fired. This alloy was given to me and I was told it was 1% tin. I'm not convinced that it's exactly 1% tin but in any event it measured 6.4 BHN. I was skeptical that it would even hit the target but it surprised me with a 3.86" average for the coated version. The barrel was squeaky clean. 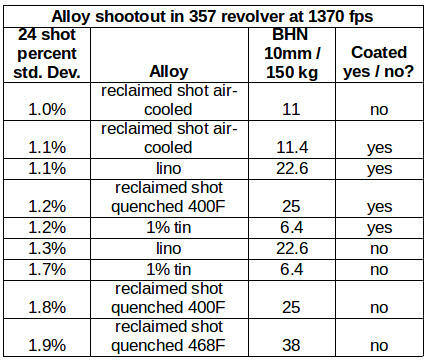 Without a coating, the 6.4 BHN alloy was less accurate at 4.03", and the velocity variation increased. Nonetheless I was surprised that it shot as well as it did. I was expecting the uncoated 6.4 BHN to plug the barrel with leading, but similar to the uncoated lino bullets there were only faint streaks of lead in the middle of the barrel, and it didn't get any worse as more shots were fired. 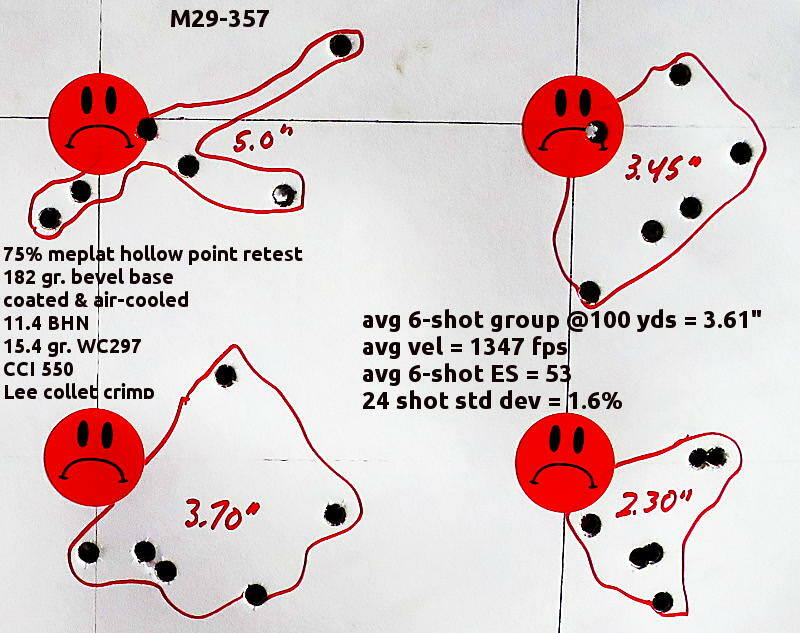 Average 6-shot group from best to worse. 24 shot SD from best to worse. The results were not what I expected, but that's why I do tests. With every alloy, the coated version outshot the uncoated version. With all but one alloy, the coated version had more uniform velocities. While some alloys performed better than others, none of the alloys "failed." No alloy made shotgun patterns and no alloy fouled badly. A reminder that this was a moderate (25,000 psi) load. If I had used a hotter load the results might have been different. Best accuracy was at 11.4 BHN though the differences in accuracy were not necessarily statistically significant. 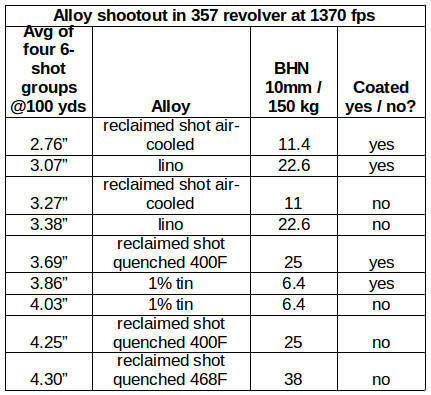 From now on I'll use a coated bullet in the 11 - 14 BHN range. I made a custom collet to hold 35 caliber bullets in the lathe while hollow-pointing. The collet is slower to use than a 6-jaw chuck, but unlike a chuck the collet can hold soft bullets without squishing them. 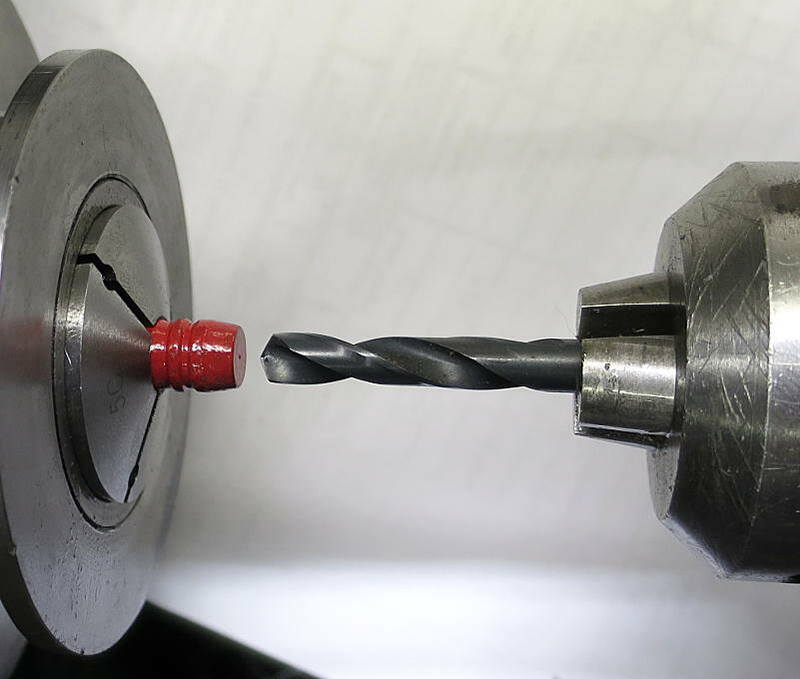 At first I tried using a 1/4" round nose end mill to make the shallow hollow point, but the end mill would sometimes bulge the noses of these soft (11 BHN) bullets, so I switched to a sharp 1/4" drill bit, and that seemed to cut easier than the end mill. I drilled the noses 0.060" deep, removing only 4.3 gr. of lead. This is just an experiment and I make no guarantees that it will work, with regards to accuracy. 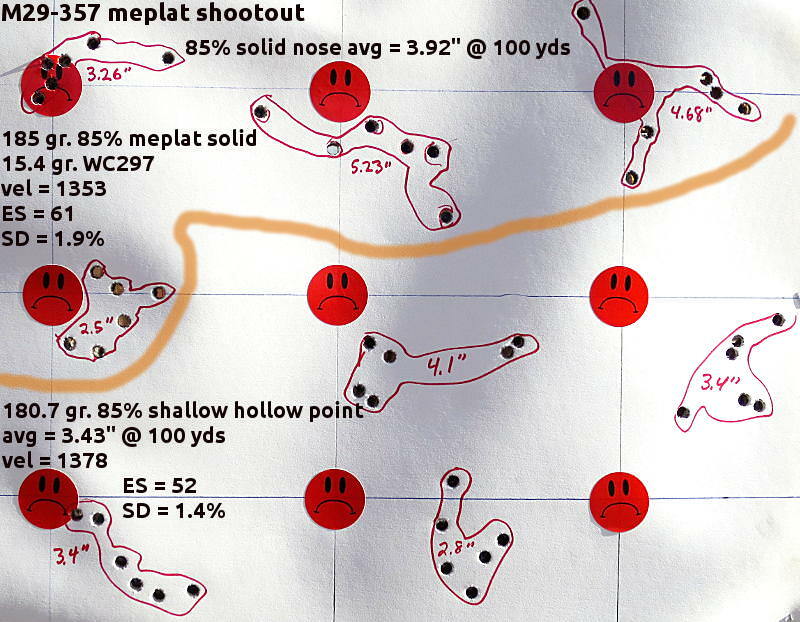 The meplat shootout continues ..... today I tested the 85% meplat with the usual control load. Top half of the target is the solid nose 85%, bottom half is the hollow point 85%. There was a switchy 5 to 7 mph wind that may have contributed to the horizontal and diagonal dispersion in some of the groups. If I waited for perfect range conditions I would not get much shooting done. For some reason today's loads had more velocity variation than normal for this load. I don't know why the meplat would change the velocity variation? 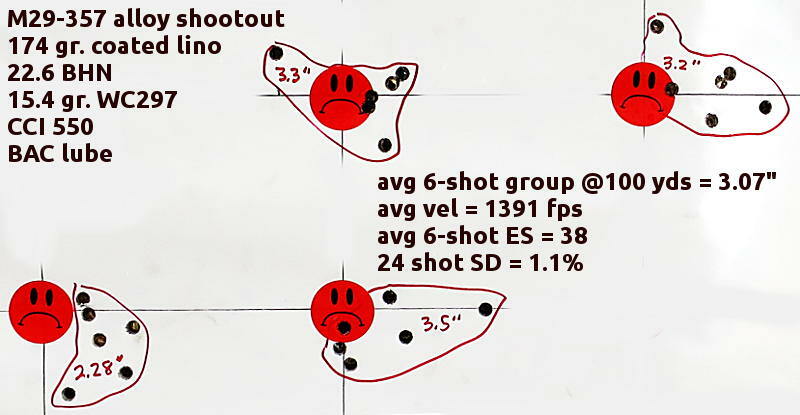 The shallow hollow point had slightly better accuracy but the difference was not significant. For now let's say that the shallow hollow point definitely did not hurt accuracy. While not as accurate as the 75% meplat, 85% shot better than I expected, and might be a good choice for hunting. My original decision to use a 75% meplat appears to have been a good guess (of course there was some experience behind that guess). I haven't decided whether to continue tinkering with meplats and HP's. Should I try a deeper HP in the 85%? Retest the 75% HP with the 11.4 BHN alloy? Try a 95% meplat? Besides meplats, the only other bullet design feature that I want to tinker with might be the ogive length. A longer ogive length might improve aerodynamics, but would require a longer jump to contact the rifling. A shorter ogive length would not have to jump as far to reach the rifling, but aerodynamics would suffer. I have already tried a shorter ogive length so all that's left is to try a longer ogive length. would be in your scenario in 35 caliber in your gun shot at your velocities with your bullets. Keep up the fun and interesting work Dan. I'll be trying two HP depths with the 95% meplat and we'll go from there. Also thinking about drilling a hollow base. Lots of experiments I'd like to do, the problem is finding time to do them. Retirement can't get here soon enough! The meplat shootout continues with a 95% meplat. I halfway expected the 95% meplat to be unstable, but it made round holes in the paper and turned in a 3.75" average. Go figure. Then I tried a couple of hollow point versions of the 95% meplat. One version was drilled with a size "F" drill 0.060" deep, the other version used the same drill except 0.160" deep. The hollow point was intended to assist with stability, but since the 95% did not have a stability problem there doesn't seem to any advantage to hollow pointing it. In fact, accuracy was inferior with the hollow points, particularly the deeper hollow point. I gave up after only 2 groups with each hollow point because it was obvious they were not going to be more accurate than the solid nose. 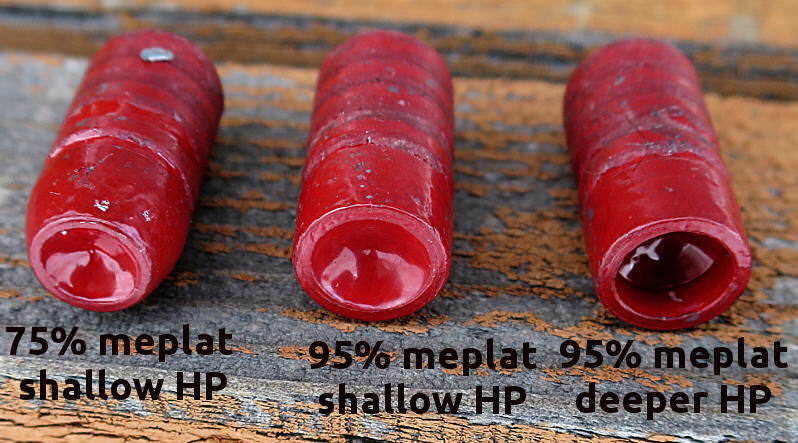 For what it is worth the shallow HP 95% averaged 4.09" while the deeper HP 95% averaged 5.8". FYI there was one squib round that only clocked 1051 fps, and it made an oval hole in the paper. All the other holes were round. That concludes my meplat shootout. The results were about the opposite of what I expected, particularly with the 50% meplat. 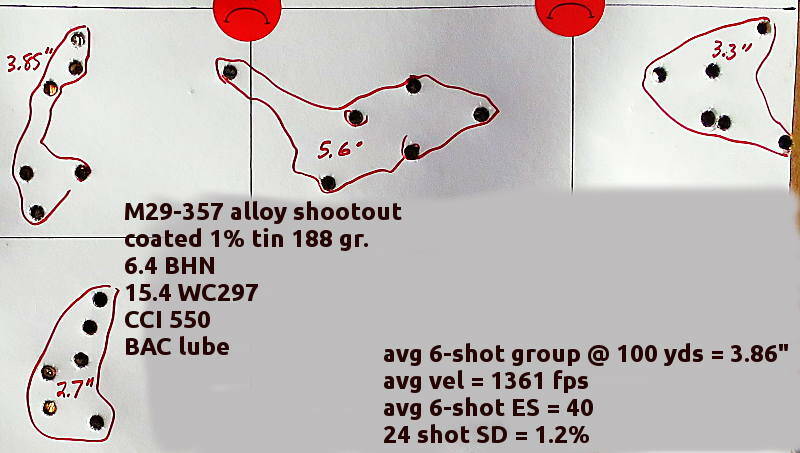 Results were mixed with my shallow hollow point experiments. Sometimes the HP version shot slightly better, other times it shot slightly worse. In some cases the differences are too small to be significant, but I do suspect the deeper 95% meplat was significantly worse than the 95% solid nose. 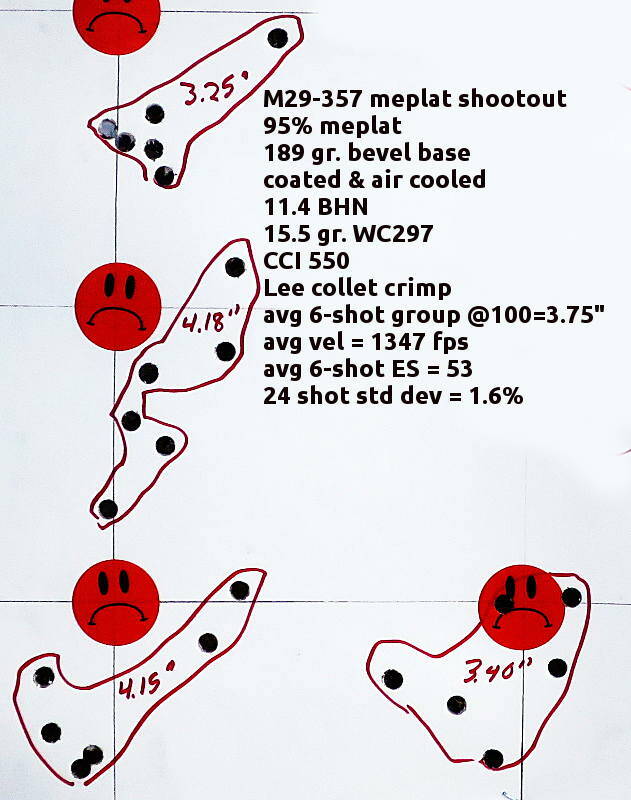 I suspect that Lee Martin "volcano" experiment showed a dramatic difference because its WFN bullet was marginally stable, and the shallow hollow point improved the stability somehow. My solid nose bullets were stable so the hollow points were a solution in search of a problem. A re-test of the coated 75% meplat with shallow hollow point. I had tested this previously but with a slightly different load that clocked over 1400 fps, so in order to give the hollow point a fair chance I retested it with the current load that clocked 1365 fps. Also, the HP was slightly different, this time using a #3 drill 0.050" deep -- that's a very shallow HP that only removed 3.2 grains so it's hard to believe that it would make a difference one way or another. The hollow point still was not as accurate as the solid nose. Four groups is not enough to "prove" a significant difference of this magnitude, but combined with the original HP test I suspect it is significant. At any rate, this shallow HP was definitely not more accurate than the solid nose. That concludes my hollow point tests. 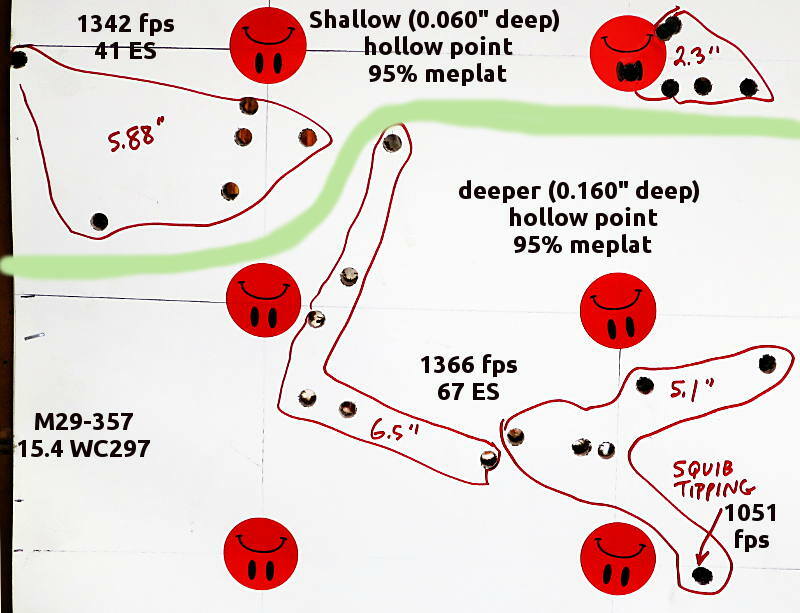 If I ever run into a load that is marginally stable then I may revisit hollow pointing, but it seems like hollow pointing does not improve accuracy if the load is already stable to begin with. -- try a GC version that is loaded full throttle. Ross Seyfried recommended full throttle loads for his 1 MOA revolver project. -- try the control bullet with 300 MP and with Lil Gun. When I am satisfied that I've thoroughly covered the different bullet designs and different loads, I may set the barrel back a few threads and try a shorter leade angle. As you may recall this existing cone was cut with a reamer marked 1.5 degrees but actually turned out to be about 1.25 degrees, so the leade is pretty long. I'm leaning toward a 3 degree leade as a compromise between gentleness and length.